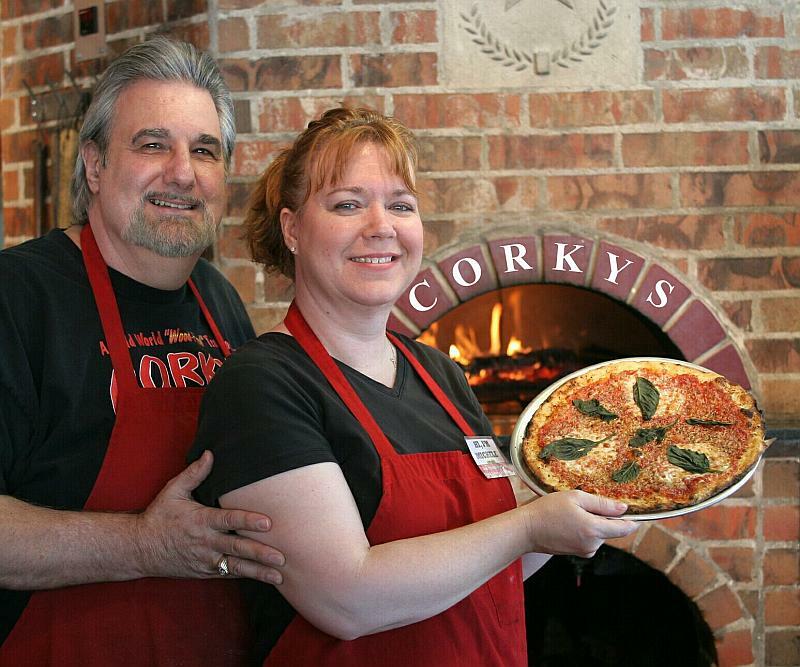 Owners Nick and Michele holding the "Queen Margherita" pizza. are offered on this page. 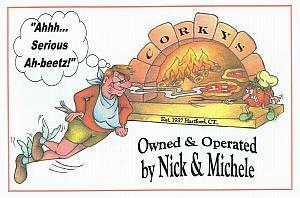 which are available at Corky's but are not yet part of our regular menu. We are here to serve you... so we invite your comments, suggestions and questions. 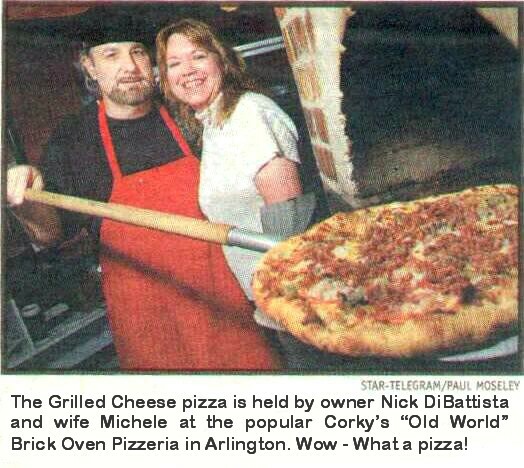 Now that's Serious Old World Italian Apizza! Apizza, Lasagna, Manicotti, Spaghetti, Panini, Cheezy Garlic Rolls... IT'S ALL GOOD! THESE FLAT-BREAD PANINI FOR YEARS! I DECIDED TO SHARE THE LOVE WITH YOU. similiar to the pizza Andrew also created. To take advantage of specials posted on this page; First print the section in which the special you wish to take advantage of, appears. Please bear in mind that specials change often, sometimes even daily. So print your desired special the same day you intend to use it. who takes your order of your intent to take advantage of the special. taking advantage of... to your order. If you received our VIP Club Specials by Email or viewed our VIP Specials page on your smart phone simply show it to the cashier. PERSONAL 1 TOPPING PIZZA AND A FOUNTAIN BEVERAGE $4.99! PERSONAL 1 TOPPING PIZZA, GARDEN SALAD & BEV. $5.99! BAKED MANICOTTI OR BAKED SPAGHETTI DINNER WITH "CHEEZY" GARLIC ROLLS $4.99! BAKED LASAGNA w/Chopped Meatball & Sausage... WITH "CHEEZY" GARLIC ROLLS $5.99! 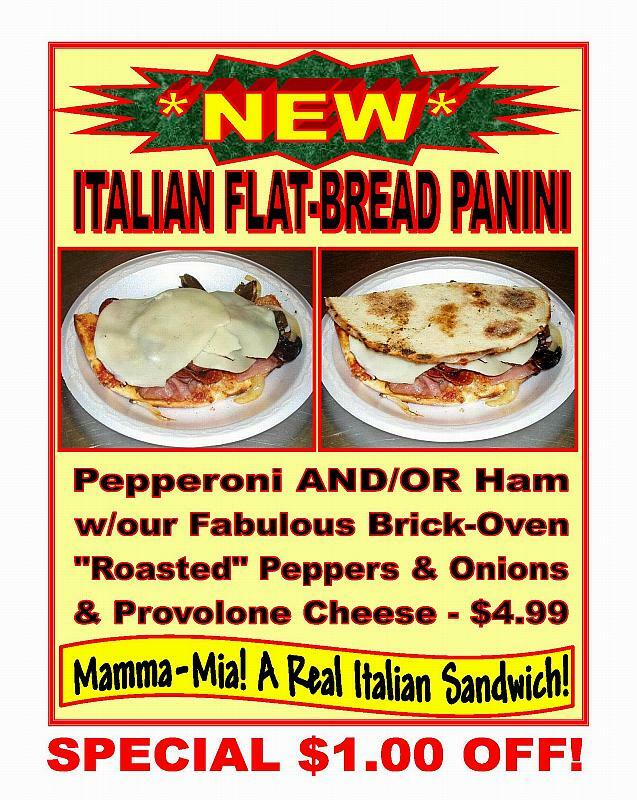 OUR FABULOUS PANINI FLAT BREAD SANWICHE PICTURED ABOVE & A FOUNTAIN BEVERAGE $3.99! Another Panini Nick likes is Italian Genoa Salami, Roasted Peppers and Provolone Cheese $3.99! For a Limited time. Tuesday - Thursday 11:00 am to 9:00 pm. Friday and Saturday 11:00 am to 10:00 pm. We're closed Sunday and Monday. 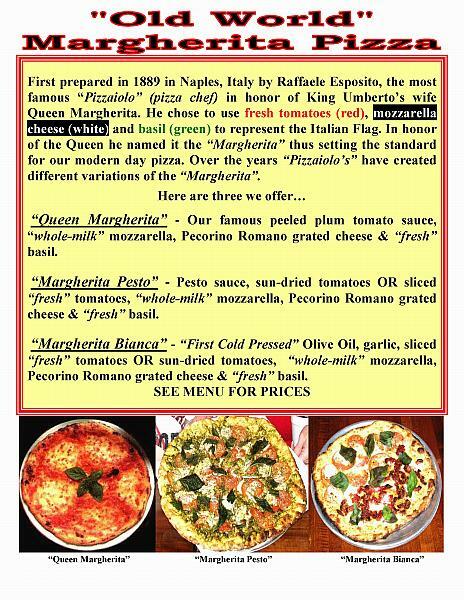 Our pizza is 100% authentic Italian Neapolitan pizza.